Parrots form strong and complex bonds with each other in nature. In many species, mated pairs bond for life. They engage in mutually beneficial behavior such as nest building, foraging, and grooming each other’s plumage. The pair will also raise their young and defend their territory. In addition to their individual bonds, parrots also form a bond with their flock. This behavior may be an evolutionary tactic used to help advance the survival of the species. According to africangreys.com, the type of flock that the bird favors in the wild impacts its bonding behavior. Birds that come from single-species flocks are less tolerant of other birds and new additions to the family. Parrots from multi-species flocks form bonds more readily with other species and multiple individuals. Parrots instinctively want to form bonds with another member of their own species. When this is not possible, they will bond with the human family that has adopted them. They will find ways to interact with you to minimize their lack of a true mate. This is one of the reasons that parrots with the ability to mimic human speech engage in the practice. They are fitting in with their new flock and speaking its language. This behavior is one of the aspects of owning a pet parrot that can be the hardest to navigate successfully. You want to bond with your parrot, as it can be rewarding for both you and the bird. At the same time, you need to be cautious not to let the bond become too strong and cross over into over-bonding. Parrots bond with a care-giving human who is regularly present in the absence of another suitable parrot. They think of your family as their flock and want to be included in its activities. Your parrot certainly wants to know where you are most of the time. In the wild, parrots have a contact call used to announce their presence and identify their flock. You will find that your bird develops a distinct call that they use when you leave the room. This is your contact call. If you can respond to it, either with a similar call or at least a consistent response, you will be engaged in bonding with your parrot. When they call to you, respond to them and it will calm their nerves as they know you are still close. Your bird may respond to being petted and having its head stroked by attempting to groom your hair or clothes. 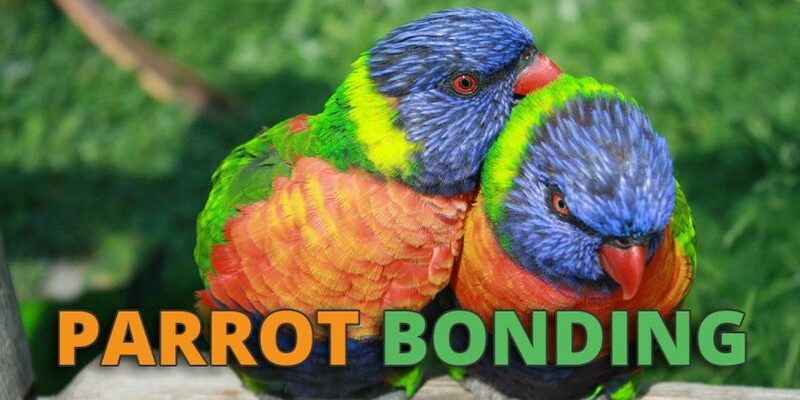 This type of bonding can be rewarding for both parties, but here is where you need to exercise caution with how you touch your bird. What is to you an innocent stroking of your bird’s tail or under its wings can be misinterpreted as an invitation to mate. Your bird will enjoy bonding by being offered treats by hand, playing, and being trained. It will soon come to expect a certain level of attention. If its expectations are not met, it may become loud and demanding. Below is a video that talks about the importance of bonding with your parrot. Some parrots, like macaws, form extremely strong bonds with one family member, almost to the exclusion of others. Others are more open to having a less intense bond with multiple family members, like the Eclectus Parrot. Separation anxiety – The parrot does not understand why its flock would leave it alone and defenseless. This would never happen in the wild and can cause your bird to experience undue stress and anxiety. Territorial aggression – If your parrot sees you as a true member of its flock, it may develop aggressive tendencies in protecting its territory, especially during mating season. Mate aggression – This is where the bird loves one individual and often acts aggressively toward the rest of the family. Excessive egg laying – Female birds who bond too strongly with their human companions can be prone to this problem. This can be extremely detrimental to their health and lead to egg binding. You can reduce the likelihood that you and your parrot will overbond and form a destructive relationship by following some simple guidelines. According to northernparrots.com, you need to try to not let your parrot become too attached to one individual. This is best accomplished by having as many people interact with your parrot as possible. Your bird may still choose a favorite from among the available humans, but by interacting with multiple individuals, your bird will be less prone to overbonding. One technique is to have designated tasks for family members to perform related to the care of your parrot. This daily contact will lead to a level of bonding and reduce overbonding with one person. Captive parrots may form bonds among members of different parrot species. While they will not interbreed, these relationships can be strong and in some instances contribute to your bird’s lack of interest in its human companions. This is not always a bad thing, as it will definitely alleviate the issue of overbonding between parrot and human. Bonding between any birds cannot be forced. Putting two birds that do not know each other together in a cage is a recipe for trouble. Similarly-sized birds should be given their own cages (or double cages) and plenty of space and time to form bonds when they are ready. Below is a video that talks about introducing two parrots to each other. Parrots are complex and intelligent animals that form social bonds among themselves and with their human companions. Understanding this behavior and how to foster a healthy bonding relationship is a key to your and your bird’s happiness.